WhatsApp is simply the world’s #1 smartphone app for obvious reasons. As you may know, Facebook recently bought WhatsApp for $19 billion. Anyways, this article is not about Facebook’s giant WhatsApp deal. By default, everyone can see the time when you last used WhatsApp, and they can blame you for not replying to their messages. I’ll show how you can add a bit more privacy to your WhatsApp by hiding “last seen at” timestamp in WhatsApp. In this article, I’ll show how you can easily hide last seen timestamp in WhatsApp for iOS, Android, WIndows and all other supported devices. In your WhatsApp, go to the Settings tab and tap Chat Settings. Go to Advanced, where you will see an option to turn Last Seen Timestamp. First, you need to download & install the latest version of WhatsApp directly from their website at this link. Now, open WhatsApp and go to Settings > Account, and tap on Privacy settings. From there you can turn off last seen & other privacy related options. As of writing, this feature has been only made available to iOS & Android users of the app. It’s worth nothing that WhatsApp is currently working to implement this feature in the Windows version of its app. 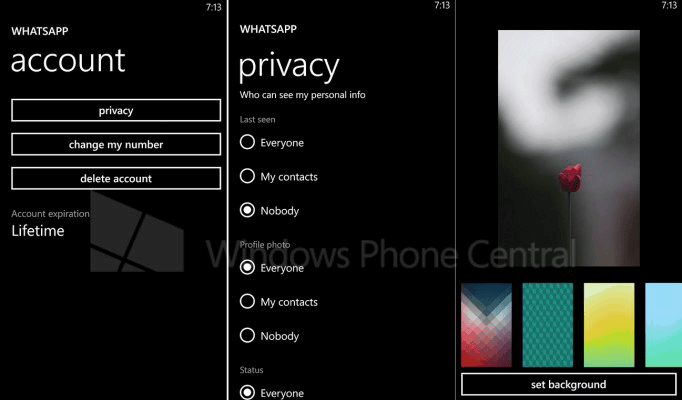 Reports claims that a private beta version for Windows has been released by WhatsApp.